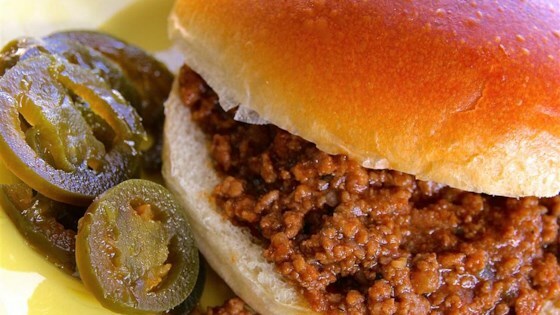 "I grew up a Manwich® kid, thinking they were the same as sloppy joes. I was dead wrong. This is the real deal. Messy, yummy, kid-friendly perfection especially on a cold night." Heat olive oil in a large skillet over medium-high heat. Saute onion and garlic in hot oil until browned, 5 to 7 minutes. Add ground beef; cook and stir until the beef is completely browned, 7 to 10 minutes. Drain and discard grease from the skillet. Transfer beef mixture to a slow cooker. Stir Mexican-style hot tomato sauce, ketchup, brown sugar, Worcestershire sauce, mustard, cider vinegar, and chili powder into the beef mixture. Cook on Low for 2 hours (or on High for 1 hour). You’ll love this cheesy hot party dip on Game Day! Butter your sandwich rolls and sprinkle garlic salt onto the butter; toast under broiler until just crispy. Assemble sandwiches and be thankful you're alive for this moment. Needed a little more spice for us...but was very good. Best sloppy joes I've ever had. Just the right combination of ingredients and a slight kick.